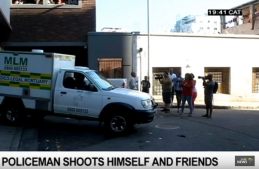 Neighbours of the three people who were shot and killed in an apartment block in the Durban CBD, say they are shocked and saddened by the incident. They gathered on Baker Street in central Durban as the bodies of the deceased were yet to be removed from the crime scene. Five other people, who were wounded, are being treated in hospital. The neighbours say the officer often held parties in his apartment and was known to have a bad temper. They say they heard several shots being fired this morning after an argument about what meal was being prepared for lunch. The street remains a hive of activity. The neighbours, who gathered outside the apartment building, say they heard arguments and screaming before the shooting. “I didn’t know there were bullets there, gunshots there. Crying inside, the man telling the girlfriend, why you was cooking chicken, you have to cook meat. The man knocked the plate of food. After that, they go, they take the gun, lock the door and start shooting people. I only heard about 7 gunshots so I decided to lock myself in the house because I didn’t want to witness anything. He likes fun, he likes drinking with his friends, he likes inviting people, it’s shocking and traumatising. He was friendly but short tempered at the same time. Whenever he is drunk, he likes having arguments,” says a neighbour. The post Neighbours traumatised after officer kills friends and himself appeared first on SABC News – Breaking news, special reports, world, business, sport coverage of all South African current events. Africa's news leader..